Leave a review for EVT! The EVT tannin filter removes tannins from your water along with unwanted minerals, discoloration, odors, and tastes often found in wells. 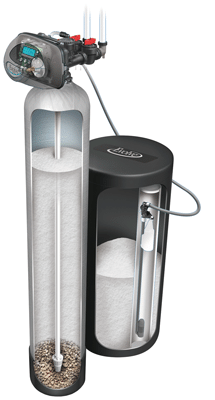 Our tannin filtration system preserves the life of your well and conserves water. Looking for an environmentally-friendly solution to your tannin issues? Contact your local Evolve® dealer to learn more today! Tannins are organic matter found in groundwater wells. These tannins are often what cause discoloration and musty or earthy-tasting water in wells. Our tannin filters are proven to successfully remove tannins in your well water for crystal-clear, great-tasting water.